I’m very excited to announce the Kickstarter campaign for my new book will launch on Tuesday February 7th, 2017. I really hope you will check in for the launch and support. Thank you to all who do! 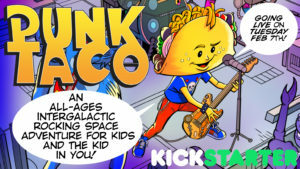 Punk Taco! Coming to Kickstarter on 2-7-17!